DTR with a great display. With the Schenker XMG A722 we take a closer look at a second device based on the Clevo Barebone W370ET. Schenker offers the notebook with GeForce GTX 660M GPU and 17-inch Full HD display, with prices starting at almost 850 Euros (~$1050). 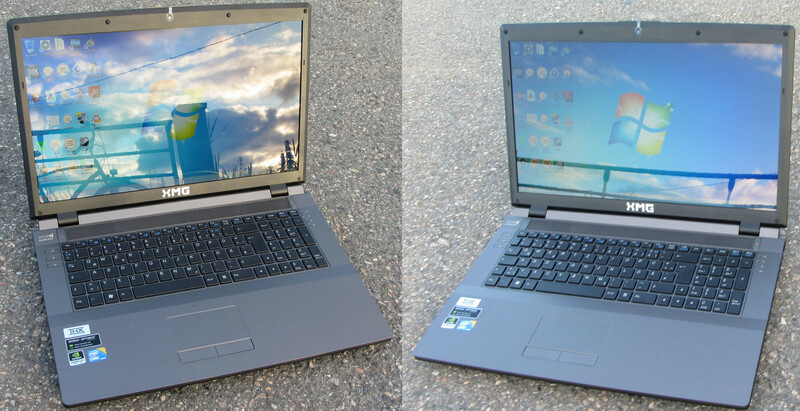 We test how the device does against its brother (One K73-2O). 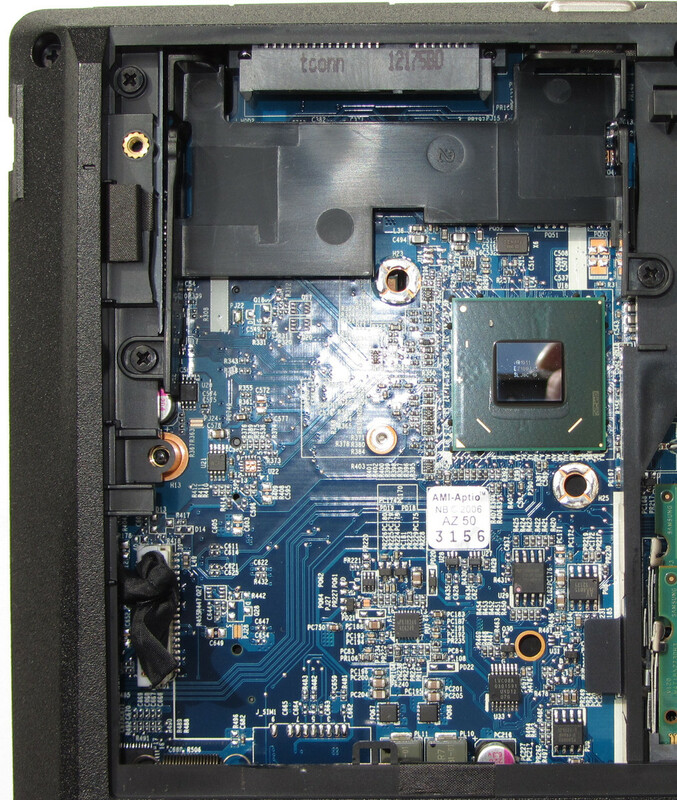 Gaming grade notebooks can be manufactured on the basis of the Clevo Barebones W370ET. 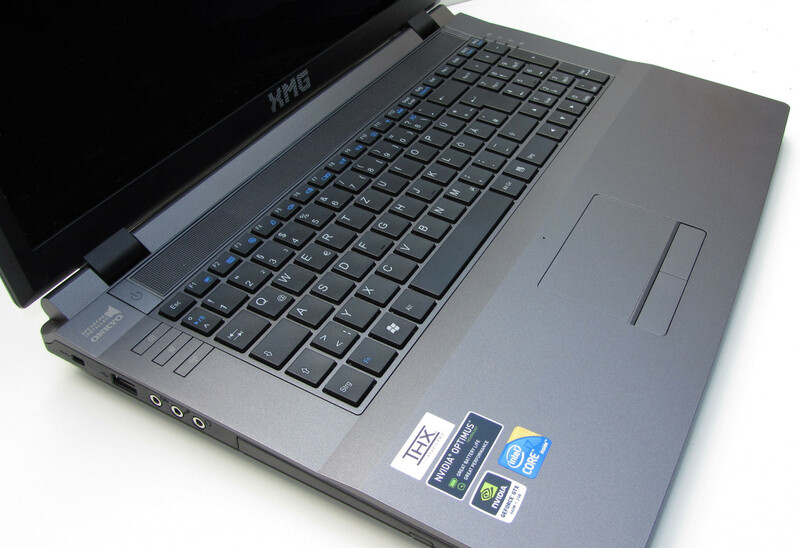 We recently reviewed the One K73-2O (Intel Core i7-3610QM). This notebook was also based on the Clevo Barebone. The Schenker comes with a slightly different hardware configuration. Therefore, in this review we will mainly go over the differences between the two devices. The Schenker XMG A722 is available in different configurations. The customer can build their own device on the Schenker website, according to personal requirements. All configurations have a 17.3-inch display (1920x1080 pixels) and the Nvidia GeForce GTX 660 graphics card in common. The prices start at 849 Euros (~$1050). 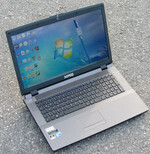 For that the customer receives an Intel Core i3 processor, 4 GB system memory, 320 GB hard drive and a DVD writer. This price does not include an operating system. Windows 7 Home Premium 64bit will cost an additional 95 Euros (~$117). Our test unit is powered by an Intel quad-core processor (Intel Core i7-3612QM). The processor has access to 8 GB of system memory. The graphic tasks are carried out by the Nvidia GeForce GTX 660M and the Intel HD Graphics 4000. Data is written on a 256 GB solid-state drive. A Blu-Ray drive is also available. The notebook weighs 3.2 kg (7.05 pounds) and comes in a matte-grey plastic housing. The case is almost identical to that of the One K73-2O. The Schenker notebook does not feature the slightly rubberized palm rests. We like the quality of the housing, workmanship is good. The rigidity is also fine. The standing stability could be a bit better: when the display is opened at more than 90 degrees, the front left rubber foot is no longer on the ground; it floats a millimeter or two above. The connections are the same for both devices: on the right side of the notebook are the Gigabit Ethernet port, three USB 3.0 port, a combo eSATA/USB 3.0 interface and one HDMI port. In addition there is a card reader, which supports the most common memory cards (SD, MMC, Memory Stick). The left side of the device hosts a USB 2.0 port, three audio jacks (microphone, headphones, S/PDIF) and a Kensington Lock. 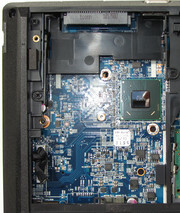 The AC jack and a VGA output are located at the rear of the notebook. Most interfaces are on the right side. The front houses only status lights. The left side is fully utilized. A projector, for example, can be connected to the VGA port at the back. 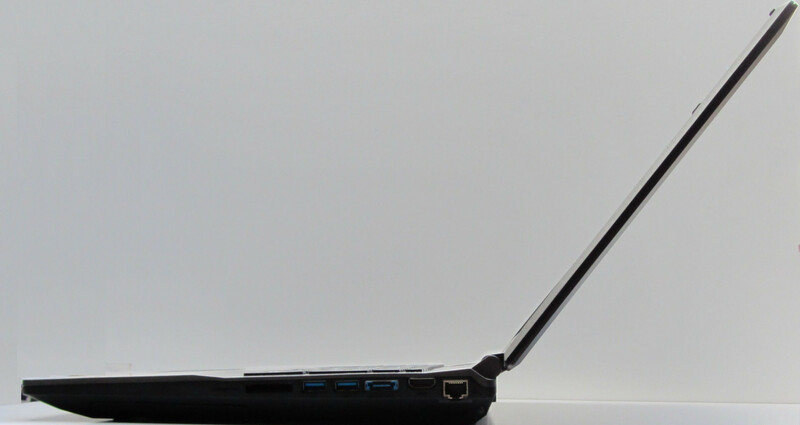 In each and every configuration, the notebook comes with a Gigabit Ethernet chip made by Realtek. In terms of WLAN the customer can choose between six different modules. Alternatively the module can be omitted entirely. The price then drops by 7 Euros (~$8.63). Our test unit is equipped with a Bigfoot Killer Wireless-N 1102 module. Serious gamers are going to be happy with it. Some of the WLAN options come with a Bluetooth chip. The Bigfoot Killer Wireless-N 1102 module is not one of them. Video calls are also possible with the notebook. In the frame of the display is a webcam (1.3 Megapixel). In terms of accessories, Schenker delivers only the essentials. In addition to a quick start guide and warranty information, the device also comes with a driver DVD. Our test unit comes with a pre-installed Windows 7 Home Premium operating system. Alternatively, customers can order the Schenker XMG A722 with either Windows 7 Professional or Ultimate. A Windows 7 DVD is not available. A fresh installation of Windows 7 is possible through a recovery partition. If you want to have a full fledged Windows 7 DVD, you can check our News page on how to make such a DVD. The notebook can also be ordered without an operating system. For the pre-installed software, Schenker relies on Microsoft: the Windows Live Essentials, the Microsoft Security Essentials and Microsoft Office 2010 Starter are all pre-installed. This should be enough for most users. Optional purchases are the Kaspersky Internet Security 2012 and a higher version of Office 2010. Praiseworthy: as with the One K73-2O, Schenker refrains from installing bloatware. Other manufacturers should follow this example. The maintenance capabilities of the notebook are exemplary. On the bottom side of the device are located two covers. Under the smaller one is the hard drive. This can easily be removed and replaced with a different one. A hard drive cage is not available. The large panel covers most of the remaining components. 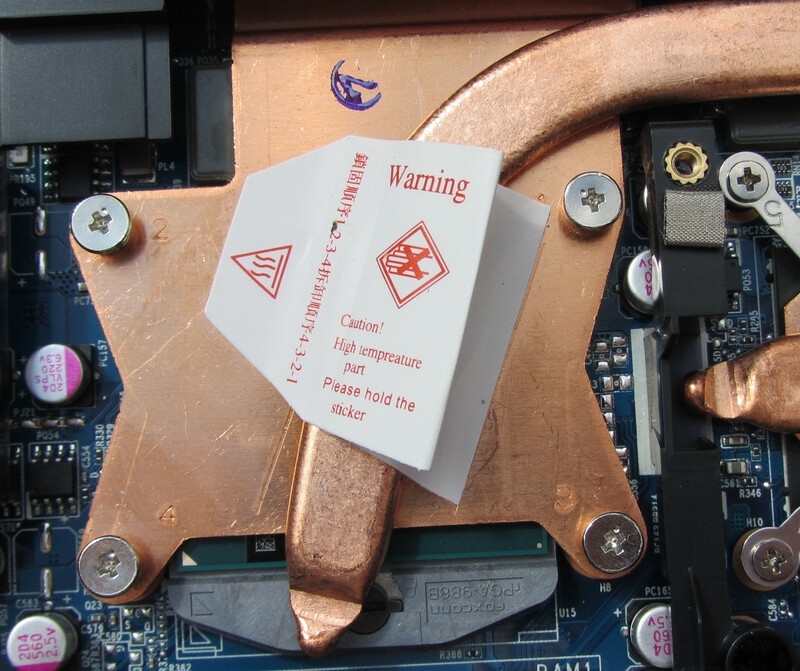 Full access to the heat sink is provided. 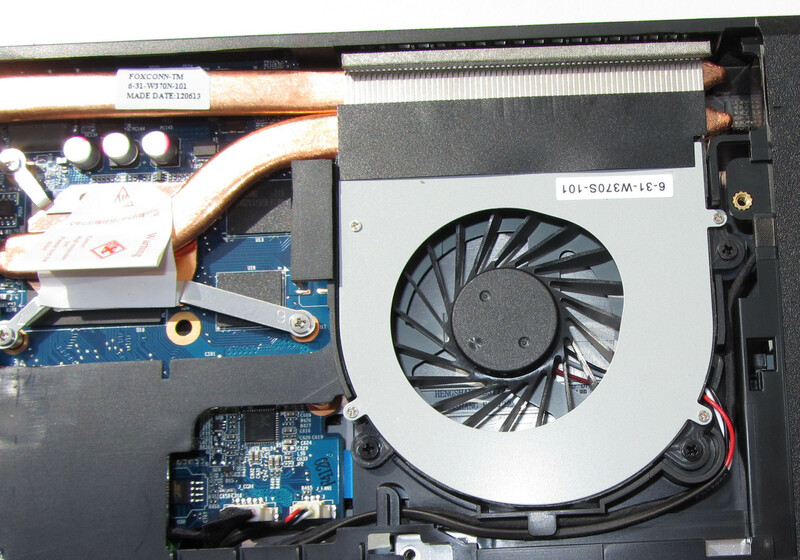 The fan can easily be removed for cleaning purposes. 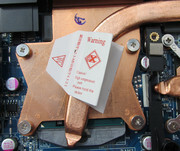 The heat sink can also be disassembled. Those who know how, can change the processor. In addition, there is space for a second hard drive. Thus the installation of an additional hard drive is possible. This way you can install Windows and the most-used applications on a fast SSD and leave the pictures, music and videos on a conventional hard drive, which offers significantly more space. 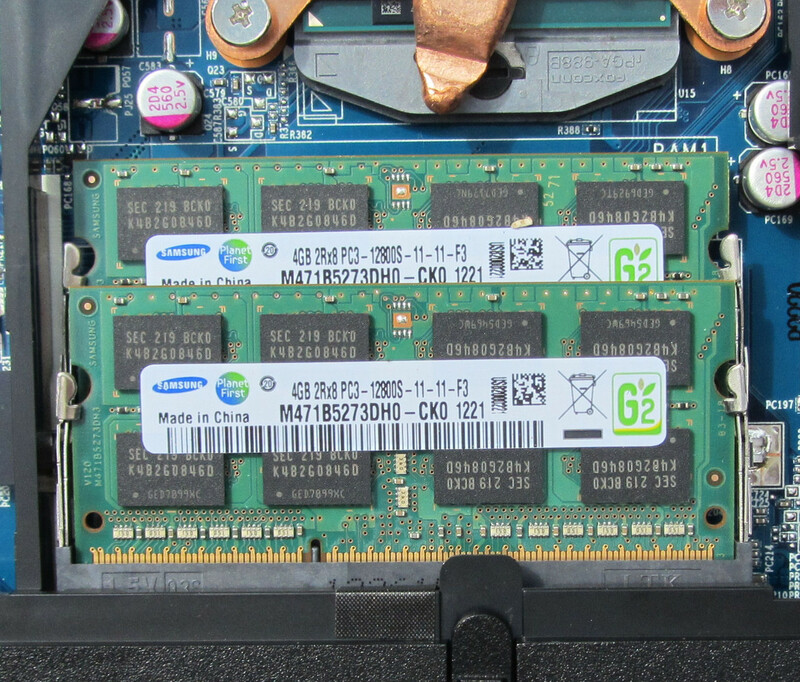 Behind the large cover, two memory slots are located. In our test unit both were occupied. A third slot is available on the other side, under the keyboard. In total the notebook supports up to 24 GB of system memory. You can check how to disassemble the keyboard in our review of the One K73-2O. There you can also find the WLAN modules. In each configuration, the XMG A722 comes with a 24-month Pick up & Return warranty. In case it is needed, the notebook is collected from the customer and then returned after the repair. The battery and the power supply come with a 6-month warranty. The warranty period can be extended: a warranty extension to 36 months (12 for the battery and power supply) costs 105 Euros (~$129). 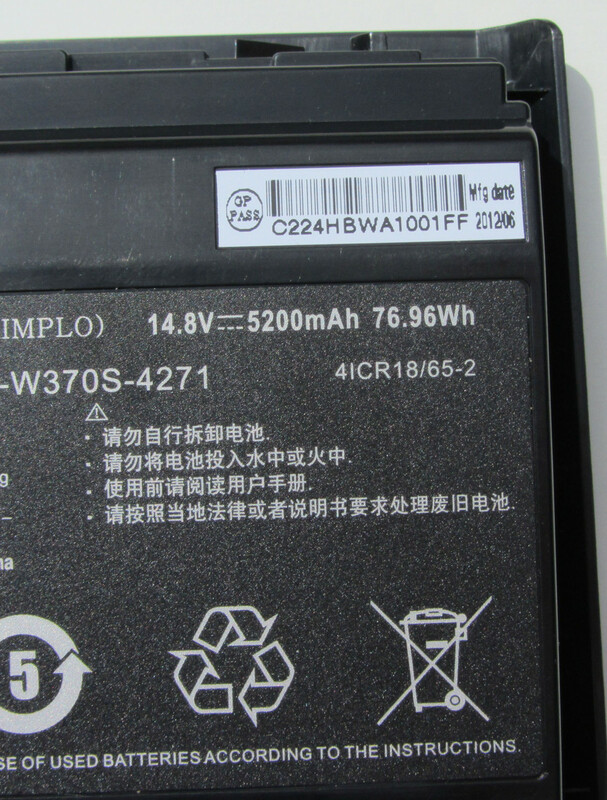 An extension to 48 months (24 for the battery and power supply) costs 210 Euros (~$259). The device has a chiclet keyboard without backlighting - just as the One K73-2O. The number pad is mandatory for a 17-inch notebook. Unlike the One K73-2O, the Schenker notebook comes with a German keyboard layout and German key prints. The main keys are 15 mm x 15 mm (0.59 inches) large and allow for comfortable typing. The stroke is easy to feel. On the left of the keyboard are three additional keys. One turns the WLAN module on/off, the second mutes the loudspeakers, and the third turns the webcam on/off. Because the palm rests and the touchpad are not rubberized, the finger glides easily with this device. A precise navigation is possible without hassle. 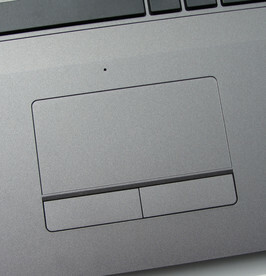 The touchpad is 90 mm x 45 mm (3.54 x 1.77 inches) large; the width is sufficient. Overall the touchpad could have been a bit higher. This would ease the multi-touch operation. Nevertheless, the gesture control (zooming with two fingers, for example) works well. Both mouse buttons are below the touchpad. They feature a clear audible and tactile feedback. The touchpad could have been a bit higher. 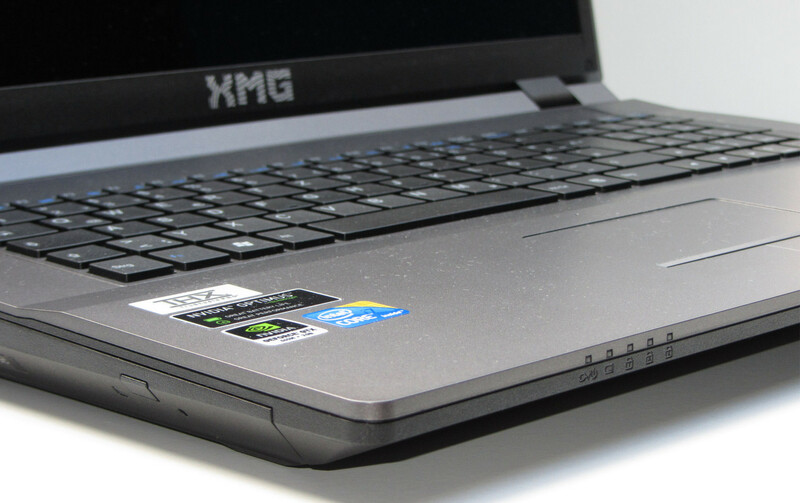 The Schenker XMG A722 in our review features a glossy 17.3-inch display. The resolution of the LED-illuminated display is 1920x1080 pixels. Schenker offers, without a surcharge, a matte display as well. 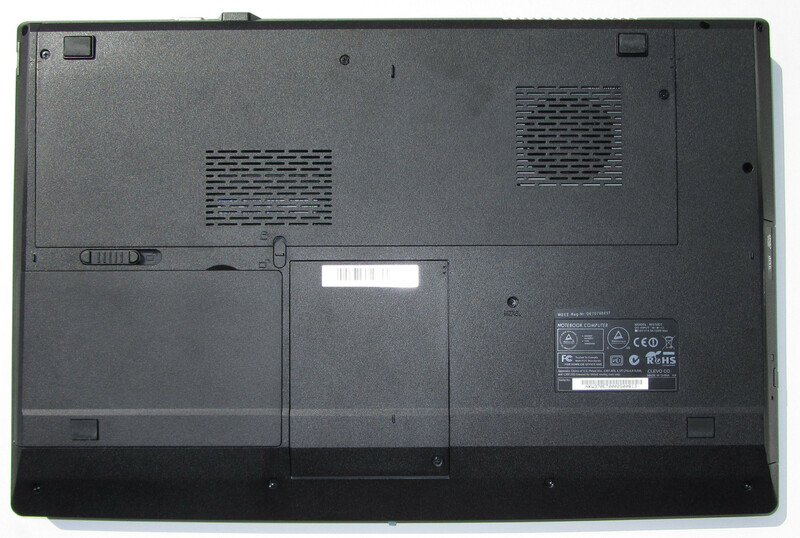 The same matte display can be found in the One K73-2O. Both displays are made by the company Chi Mei and seem to be part of the same model line. 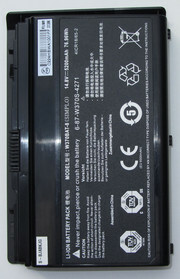 The matte display carries the designation Chi Mei N173HGE-L11, the glossy one - Chi Mei N173HGE-L21. 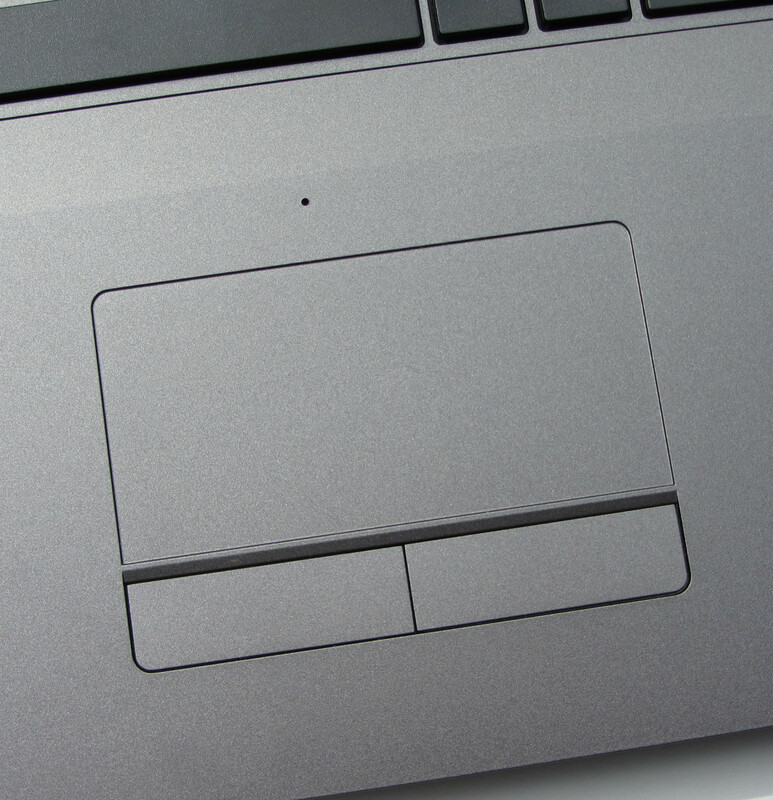 With an average 260.6 cd/m², the matte display has a comfortable level of brightness. The glare display is even better with an average brightness of 290.6 cd/m². Overall the distribution in both the glare (78%) and matte (79%) displays could have been better. Like the display in the One K73-2O, the one in the Schenker has a very low black level of 0.3 cd/m². 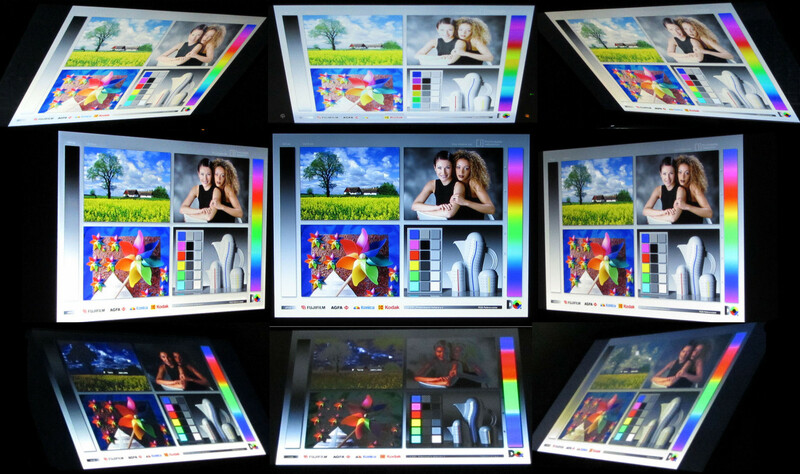 As a consequence, dark pictures are intensively displayed and do not deteriorate to a grayish mix, as is the case with many cheaper displays. The already very good contrast level (855:1) of the One K73-2O is surpassed by the 1013:1 ratio of the Schenker notebook. Excellent. It is a pleasure to watch videos on this display, as the colors are properly vivid. The sRGB and AdobeRGB color spaces cannot be fully reproduced. 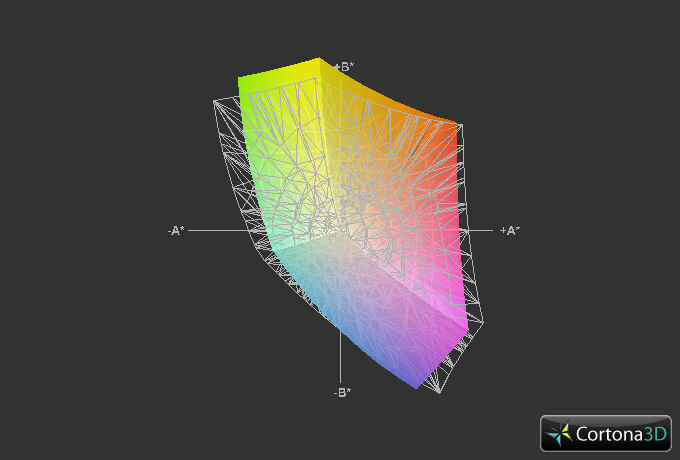 This is not that bad, because these color spaces are important only for professionals. The Schenker XMG A722 in the outdoors. In principle the brightness and high contrast allow the use of the display in the open. This undertaking is hindered by the reflective surface. Bright places and direct sunlight should be avoided. The outdoor use though, plays only a minor role for the Schenker XMG A722. We are talking about a DTR, whose main use is thought to be inside and on the desk. If the notebook is going to be carried outside a lot, we recommend purchasing the matte Full HD display (for test results see One K73-2O). The horizontal viewing angle stability is very good. Even at an angle of nearly 180 degrees, the image remains almost complete. It only gets a bit darker. In the vertical angles the pictures breaks down significantly more. Here it makes a difference whether the angle is changed downwards or upwards. The image changes significantly faster when the display is tilted backwards. All in all, the viewing angle stability is more than all right. The viewing angles of many other notebook displays are considerably more unstable. The hardware configuration is more than enough for all the common user scenarios. Office applications pose no problem. DVD and Blu-Ray playback also does not challenge the notebook. It should again be specifically mentioned that it is a pleasure to watch videos on the display. 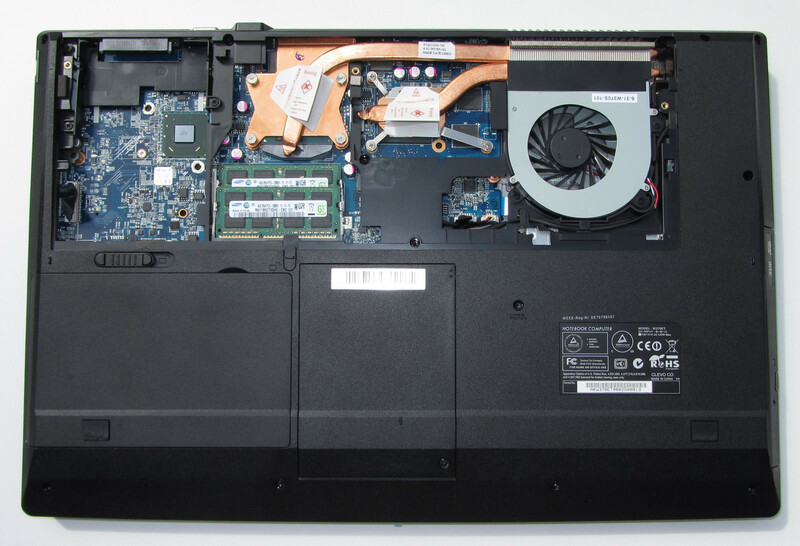 The GeForce GTX 660M makes the notebook interesting for those who like to play games, but do not require maximum quality or highest resolution. The fast, high-performance components, the great display and the option to install a second hard drive, predispose the notebook for video and image editing. Our test unit has an Intel quad-core processor (Intel Core i7-3612QM). The processor comes from Intel's latest Ivy Bridge generation. The CPU operates at 2.1 GHz. This can be increased to 2.8 GHz for all four cores, to 3 GHz for two cores and to 3.1 GHz for one core. The technology behind this is called "Intel Turbo Boost". The frequency increase happens automatically. The Core i7-3612QM has a TDP value of 35 W. The TDP of the Intel Core i7-3610QM (One K73-SO) is 45 Watt. Since the Schenker XMG A722 is also based on the Clevo Barebone, the CPU handles just like in the One K73-2O. The Turbo Boost of the CPU is not activated under load. During our full load test (Prime95 and Furmark running simultaneously) the CPU operated constantly at 2.1 GHz. The same thing happens under the Cinebench tests. The reason: as soon as the Nvidia GPU is activated, the CPU turbo is no longer used. This cannot be turned off. Even on battery, the CPU ran at 2.1 GHz under full load. The results of the Cinebench tests are well below what the same processor can achieve in other notebooks (for example the Medion Akoya P7815-MD98063). Here Clevo has wasted a lot of potential. With the One K73-2O we could achieve better results when the integrated Intel graphics chip was explicitly activated. This can be done in the menu of the Nvidia driver. We did the same with the Schenker XMG A722. However, the turbo was still barely used. Now and then the CPU cores were sped up to 2.8 GHz. The time it stayed at that frequency though, was always below one second. Thus the results of the CPU test increased marginally. The results from the GL tests, as one might expect, dropped drastically. The posted results were achieved with Optimus turned on (= the GeForce GPU was used). The system is fast and nimble; Windows 7 loads quickly. The system benefits from the fast SSD. The results from the PCMark tests are at the expected level. They could still be better, but the CPU turbo was active during the PCMark tests. The One K73-2O achieved better results. Responsible for this is the 12 GB of system memory, somewhat better CPU and a considerably faster SSD. 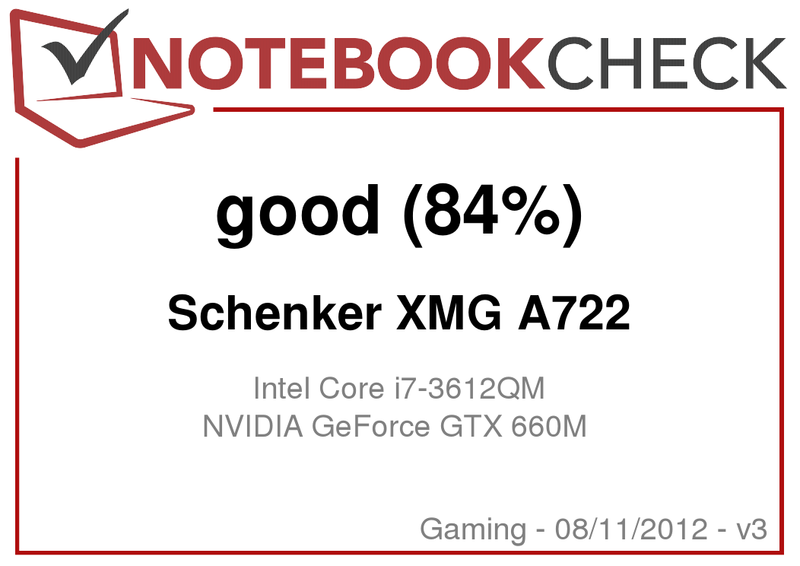 Interestingly, the Windows 7 Experience Index of the Schenker XMG A722 (7.2) is a bit higher than that of the One K73-SO (6.8). The same graphics cards, but different results. We attribute this to the different driver versions (One K73-2O: ForceWare 304.79, Schenker XMG A722: ForceWare 295.93). 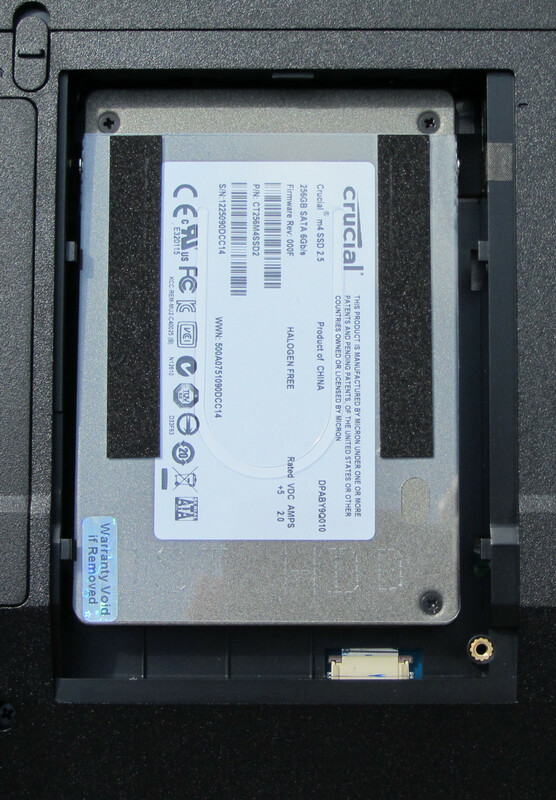 Schenker has equipped our test unit with a solid state drive by Crucial. 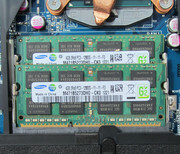 The SSD offers a capacity of 256 GB. The reading rate of 479.3 MB/s is clearly in the green zone. The write speed of 184.52 MB/s could be a bit faster. Other solid state drives perform better. Overall the disk works quickly and smoothly. No delays occurred. The notebook offers space for a second hard drive. 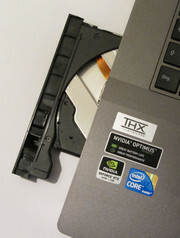 Thus it is possible to install a conventional and cheap hard drive on which to store personal data. Praiseworthy is the easy installation and removal of both hard drives. The Schenker A722 comes with the same graphics chip as the One K73-SO. The daily tasks are handled by the Intel HD Graphics 4000; the performance-hungry applications, such as games, are calculated by the Nvidia GeForce GTX 660M. The GeForce GTX 660M is representative of the upper middle class of video cards. The GPU supports DirectX 11.1 and works at 835 MHz. The frequency can be increased to 950 MHz. Even during our full load test, the Nvidia GPU's turbo function was always operational. It also made no difference whether the notebook was used on battery or plugged in. The turbo increase the clock frequency of the GeForce GX 660M to 950 MHz. The base clock is 835 MHz. The results of the various 3D benchmarks were at the level of other notebooks with the Nvidia GeForce GTX 660M. The One K73-2O is marginally ahead of the Schenker XMG A722 in the 3D Mark Test 06, Vantage and 11. Possible reasons: different GPU drivers, CPU and/or hard drive. 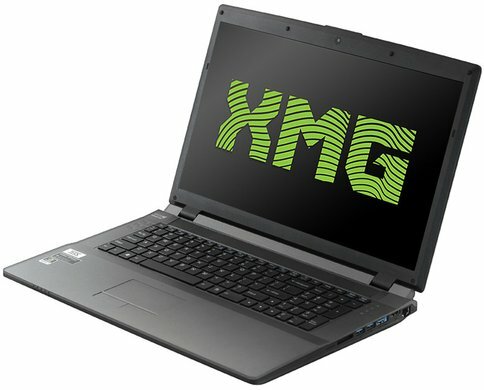 The Schenker XMG A722 copes with current games smoothly at 1366x768 and higher-quality settings. Even at Full HD resolution and higher-quality settings, the notebook still achieved playable frame rates in many games. Here though, you will have to try it out for yourself. The compromise between high resolution and presets lies at 1600x900 pixels, which the glossy display of the Schenker XMG A722 interpolated as good as the matte display of the One K73-2O. The test results of both notebooks are roughly at the same level. Games that rely heavily on the CPU, worked better on the One K73-2O. Here the slightly faster CPU is noticeable. Even the identical One K73-2O is subtly or not at all audible in office use. The Schenker XMG A722 exceeds the results of the One K73-2O and is thus even a bit quieter. The results of both notebooks are praiseworthy. Ultimately we are dealing with DTR notebooks and no customer would want to be bothered by a loud fan while checking their e-mails. Even under full load the Schenker XMG A722 is quieter than the One K73-2O. Nonetheless, even with the Schenker the maximum noise level is well in the bothersome area. The comparatively lower emissions are thanks to the Core i7-3612QM processor. It has a TDP that is 10 W lower than that of the Core i7-3610QM (One K73-2O). Thus there is simply less heat to be dissipated. The Schenker XMG A722 under full load. In idle state, temperatures were always in the acceptable range. The palm rests remained cool. Under load, the measured temperatures were mainly in the 30 oC range. Rarely was the 40 °C mark reached. Even under load the palm rest area remained cool and comfortable work with the notebook was still possible. The heat emissions for such a potent notebook are overall fine. While the CPU of the One K73-2O was throttled down to 1.2 GHz under full load, the CPU of the Schenker XMG A722 worked constantly at 2.1 GHz. After one hour at full load (Prime95 and Furmark running simultaneously), the temperatures had stabilized at 64/65 oC (GeForce GTX 660M) and 76/77 oC (CPU). Here the lower TDP of the Core i7-3612QM is also positively noticeable. The One K73-2O reached high temperatures after an hour under full load. (-) The average temperature of the palmrest area of similar devices was 28.7 °C / 83.7 F (-4.1 °C / -7.3 F). 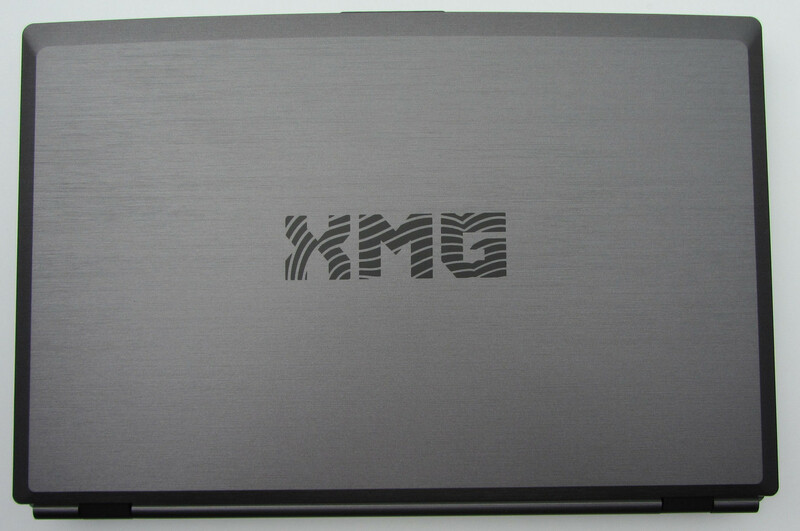 Sound output of the Schenker XMG A722 is no better than that of most other notebooks. Despite the integrated Onkyo loudspeakers and a THX certification, the former produce only an average sound. Power and volume are lacking. In addition, the sound is a bit tinny. What we liked was the clear voice reproduction. It is not surprising that a powerful notebook like the Schenker XMG A722 consumes more energy than a simple office notebook. Nonetheless, the power consumption of the Schenker XMG A722 is moderate on average. In idle state we measured a consumption of 14 to 21 W. The One K73-2O is again left a little bit behind. At medium load (3D Mark 2006) the consumption is at 74.3 W and thus 9 W below the One K73-2O. Under full load (Prime95 and Furmark) the power supply is fully utilized. We measured a consumption of 122 W. This can only occur with the battery being charged at the same time. Otherwise the consumption under full load is about 104 W.
The Schenker XMG A722 reached in idle state a runtime of 6:01 h (One K73-2O: 5:12 h). We tested the idle usage with the Battery Eater Reader test. With it the brightness is set at minimum, the energy saving profile is activated and the WLAN module (other wireless modules are not available) is turned off. Under load the notebook reached a runtime of 1:50 h (One K73-20: 1:15 h). 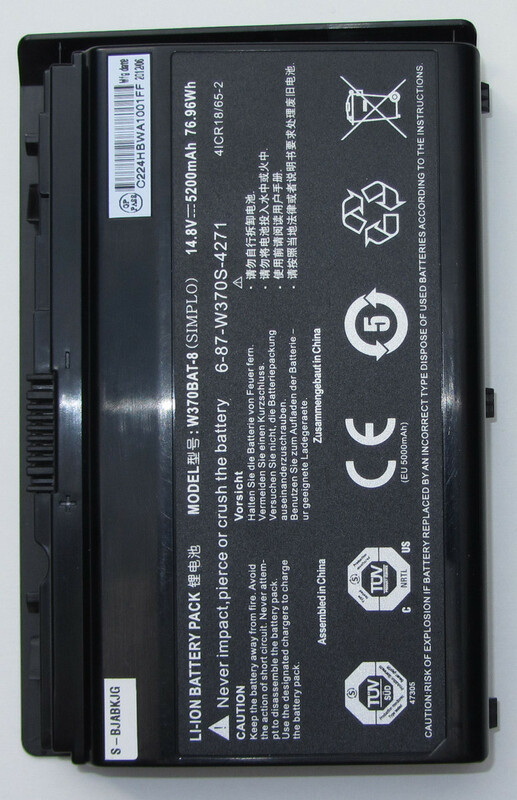 Here the Battery Eater Classic test was used: the display is set to maximum brightness, the high performance profile is chosen and the wireless modules are turned on. For this test we had to explicitly choose the Nvidia GPU in the driver options, otherwise the Intel GPU was used. With the Intel GPU activated, the notebook reached 2:04 h under load. In the WLAN test a single battery charge is enough for a runtime of 4:18 h (One K73-2O: 3:38 h). During this test, a script reloads the websites every 40 seconds. The energy saving profile was chosen and the brightness was set at about 150 cd/m². A runtime of 3:32 h (One K73-2O: 2:50 h) was achieved in the DVD test. This is enough for two movies. For the DVD test the wireless modules are turned off the brightness is set at maximum. Energy saving or high profile is chosen (if the DVD cannot be played smoothly). 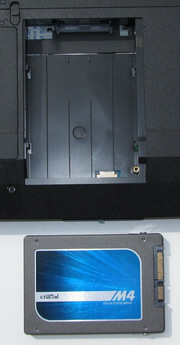 A Blu-Ray test could not be performed, because the notebook does not have the corresponding application pre-installed. The battery runtimes are very good for a notebook with a quad-core processor and a GeForce GTX 660M GPU. 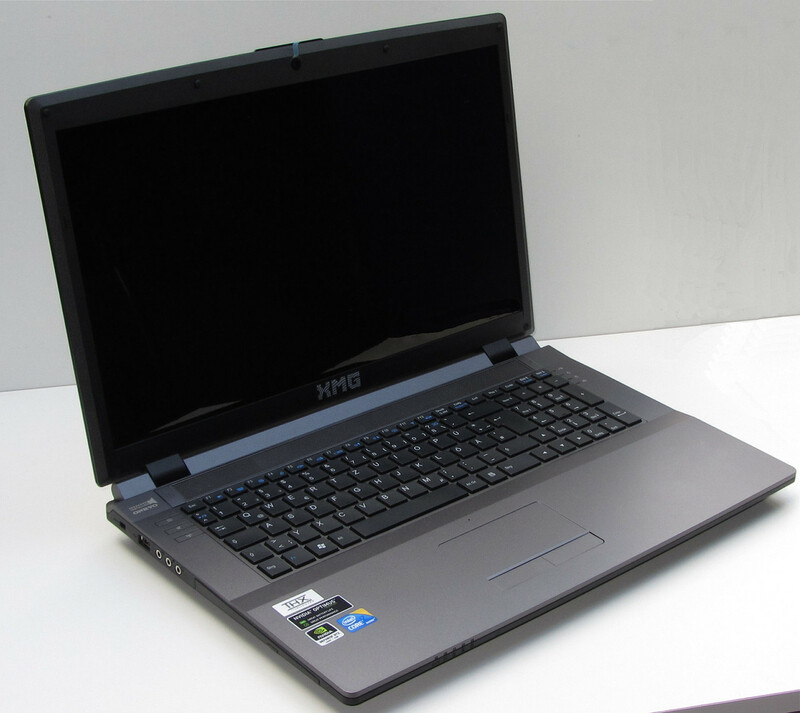 The notebook benefits from the high-capacity battery, Nvidia Optimus and the 35W quad-core processor. The runtimes of the One K73-2O were significantly exceeded, as was expected. The already positive verdict of the One K73-2O can be confirmed with the test results of the Schenker XMG A722. This is not surprising as both notebooks are based on the Clevo Barebone W370ET. Clevo offers a good DTR barebone for users that want to occasionally play games, but also want to use the notebook for video editing. The glossy Full HD display in the Schenker does not lag behind its matte counterpart. It even delivers better results: better black level, higher contrast and higher brightness. The displays represent an undisputed highlight of the Clevo Barebones. The notebook is also interesting to users, who do not necessarily have an interest in playing games. Starting from 850 Euros (~$1050) you get a DTR with a great display, which you would not want to miss. And don't forget the excellent upgrade capability of the notebook. Both Schenker and One offer the notebook with CPU that has a different TDP (35 W and 45 W). These differences are noticeable in practice. The CPU in the Schenker has a TDP of 35 W. The Schenker XMG A722 shines with a better battery life and a comparatively lower power consumption than the One K73-2O. One should take into account the TDP when buying the notebook, since runtimes and emissions play an important role. The lid cannot be opened any further. The power button is located above the keyboard. Useful: the three additional buttons allow for a quick on/off switching of the webcam, audio and WLAN module. 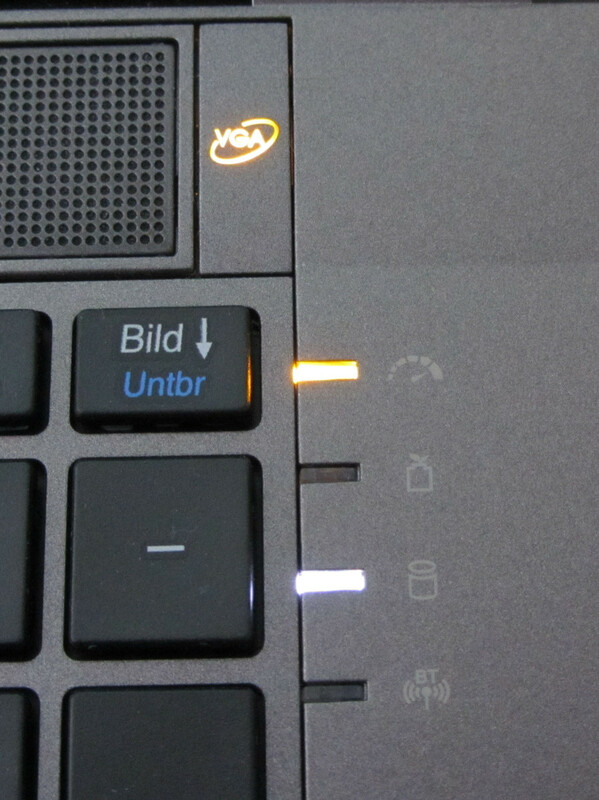 With the GPU button ("VGA") you can choose whether the Nvidia GPU (orange) or the Intel GPU (green) should be used. 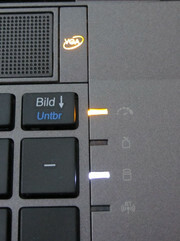 The LEDs below show if the notebook is used in performance or in energy saving mode. The gray colour is dominating. ...and has a large capacity of 77 Wh. Great: The fan can be disassembled for cleaning. It is even possible to replace the CPU. Two of the three memory slots are available through the maintenance cover. 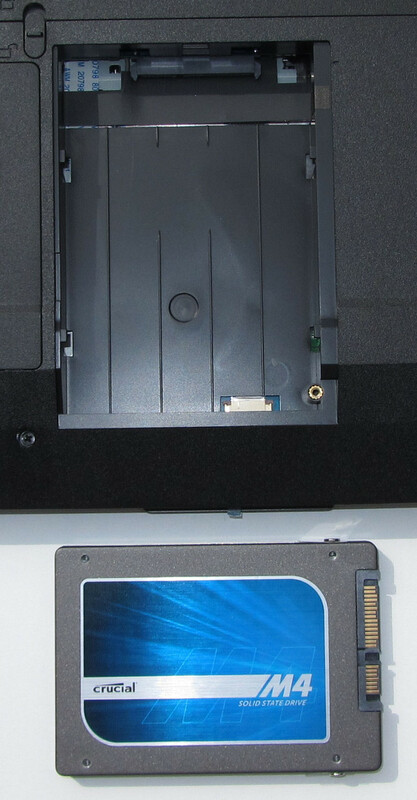 Behind the cover is a slot for an additional hard drive. On the bottom side is a large maintenance cover. 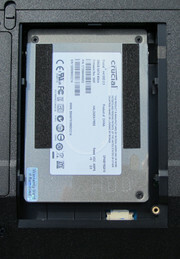 The hard drive can be replaced quickly and with ease. 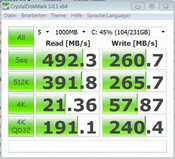 Our test unit has a fast SSD. A Blu-Ray drive by Optiarc is also on board. Just as with the One K73-2O, we were pleased with the Full HD display of the Schenker XMG A722. The CPU turbo function is not operational when the Nvidia GPU is activated.